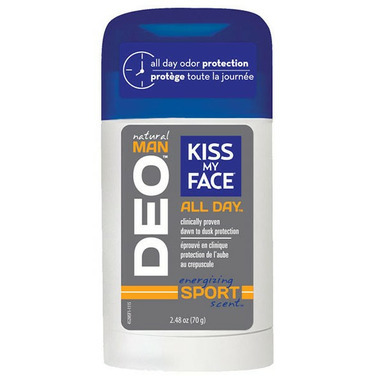 Kiss My Face Natural Man Deodorant provides all day protection that is safe and effective. With odor absorbers like Witch Hazel, Baking Soda, Green Tea and Thyme. Plus naturally nourishing antioxidants like Aloe. It goes on clear with no white marks. Aluminum Chlorohydrate Free, Paraben Free, and always Cruelty Free. Energizing Sport Scent. The only deodorant that both me and my husband use. Its the only natural deodorant that i have found, that actually works! Smells good, but unfortunately it burns my skin and causes it to peel.